While being abroad last week I managed to see Paul McCartney's concert in Bologna, Italy on 26/11/2011. The event was the first of the European gigs on his "On the Run" tour and I hope this article could give a good overview of what to be expected from Paul's subsequent shows. Because I don't like sitting at the sides of a venue and since there were not any seating places in front of the stage in the case of Unipol Arena, I had to get a standing ticket. And because all of these tickets were sold out at the time I knew I could go to the concert, I made the mistake to use Seatwave.com aftermarket ticket service, which unfortunately appeared to be among the most amateurish services I had ever used in my entire long-lived Internet experience. Due to the latter fact as well as for some Bologna traffic problems on the way to the venue, my position in the hall was not among the best and although I had a direct view to the stage, it was mainly for the presence of a couple of big screens that I was able to see Paul McCartney and his band in good proportions. The gig started with a small (normal) delay and continued for not less than two and a half hours. Sir Paul McCartney was in a relatively good shape considering his age. He changed half a dozen of musical instruments including bass and 6-string guitars, piano, mandoline and a small size guitar. McCartney's band comprised of good players who were almost constantly smiling and apparently having a good time on the stage. Because of Paul's frequent instrument changes some of his fellow musicians were also able to demonstrate skills on various instruments. The audience counted about 20 thousands of fans. They were of all ages but I was surprised that the number of young people was considerable. I saw several persons that almost lost consciousness but I would attribute this to their inexperience in crowded areas rather than some 21st century "Beatlemania". The sound was not at its best in the beginning of the show but after a couple of songs it got better and was decent until the end of the gig. The lighting was Ok and as mentioned already the big video screens were of huge help for many of the attendees. There were not numerous lighting or pyrotechnic effects. There was not any fancy choreography. The major part of the show was just great music, dedicated performances, a lot of smiles and just occasionally there were some remarkable special effects. It was just as it had to be for a performer who created (many of) the most recognizable songs of the 20th century. As for the songs, many of Paul McCartney's masterpieces were there. He played more than 20 songs of the Beatles, 5 songs of his great Band on the Run album plus several other gems from his long career. 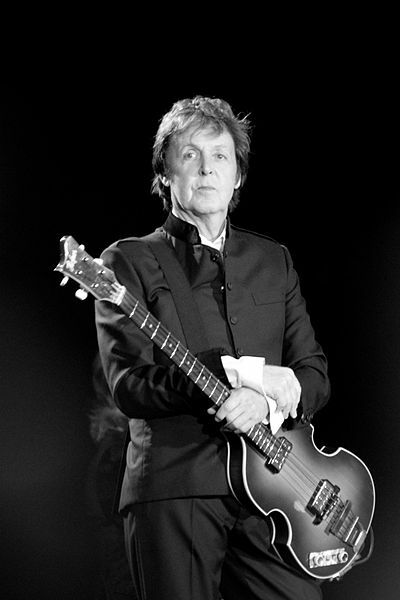 Of course, in a setlist comprised of just 35 tracks (otherwise, more than enough for a single concert), Paul could not include even every big hit he had ever written. But it was nice to hear many of the songs which had made the Beatles such a significant phenomenon and some of McCartney's Wings and solo greatest hits. Sir Paul McCartney tried to include a bit of everything. There were plenty of ballads as well as many harder rocking tracks. He sang a song for John Lennon ("Here Today") and included a part of "Give Piece a Chance" at the end of "A Day in the Life". He sang "Something" for George Harrison. He played a small tribute to Jimi Hendrix (a piece of "Foxy Lady"). There were some fireworks on "Live and Let Die" and of course, the recent Grammy winner "Helter Skelter" was also included in the set list. Several times, Paul tried to spoke a little bit of Italian as a kind gesture to the public and at the end he performed his usual two small sets of encores. The gig was a good value for money, something I would naturally expect from Paul McCartney. The only thing I have to stress and it is not a fault of McCartney's or his crew is that if you are a fan of a particular performer or a band, you should try to be closer to the stage, either sitting or standing, because the emotions are completely different there. I almost always manage to achieve a good position (if I care for the artist) but unfortunately, I was not able this time which spoiled the gig a bit for me. Apart from this personal reason, Sir Paul McCartney and the concert as a whole were great and I would definitely recommend attending one (or more) of his "On the Run" tour gigs if you have the chance. At last, below are the songs Paul McCartney played in Bologna, not ordered in the particular setlist's sequence (note that "Come and Get It", a song first recorded by Paul at the end of the Beatles' era, was performed live by McCartney for the first time ever).